If you are planning to start a blog or your new job includes blogging duties, you will need to work on improving your writing skills. You can never perfect your writing. It should be a constant process of self-improvement. One of the most important aspects of writing is your grammar. Nobody will take you seriously at this job unless your content is perfect. Luckily there are a lot of online grammar and punctuation tools that can help you with improving your writing quality. I know what you are thinking – I should be able to fix my mistakes and proofread my writing. But, the fact is that even famous writers have editors and proofreaders who double check their content. It is a regular thing when you do a lot of writing because you are not a machine that doesn’t make mistakes. Given the fact that you are not a famous writer and don’t want to spend a fortune on editors, the best option is to find a reliable writing tool. That tool should help you to filter your writing and improve all the tiny mistakes that mean a lot. No two grammar checker software solutions are made equal. Each one has its specific features and integrations. Before you can choose one, you have to compare it against your personal needs and preferences. Here are a few things that you should know if you want to be able to choose the right grammar checker software for you. When it comes to price, you have several options. There are a few grammar checker tools that offer free unlimited use but with limited access to features. If you are a native English speaker this might be a great way to save some money and still benefit from the software able to fix small grammar mistakes. Grammar checker software companies have different pricing policies. This is why you will be able to find solutions available as one-time purchases, monthly, quarterly, yearly, and three-years subscription plans. The monthly subscription plan is very convenient if you don’t have a constant workflow. You can decide when you want to use the tool and cancel the subscription afterward. Finally, the grammar checker software market is flooded, and you can often see these tools on attention-grabbing discounts. If you are not in a desperate need of one, we suggest you identify the one that suits you best and wait until its price drops. All grammar checker solutions can be divided into two categories – on-premises and cloud-based solutions, or in layman terms, tools that work offline and online. Since only you know when and where you prefer to write, you will have to decide. Offline grammar checkers are convenient when you are on a constant move and don’t have access to the internet. Online tools come with considerably more features and support more integrations. We will come to this later on. There are even some tools that work perfectly fine when you are either off and online. The bottom line is – if you find a tool that suits your personal needs, in terms of integrations and features, make sure to check whether it exclusively works online, offline or supports both modes. Furthermore, grammar checkers offer dedicated standalone apps for major desktop and mobile operating systems (Windows, Mac OS, Android, and iOS). Make sure that your favorite OS and device are supported before you buy it. Grammar checkers are not only designed to help you improve your proficiency in English, but also make sure that your content is unique. Each one of the tools comes with a specific set of features. Some of these features are only accessible in specific subscription plans. Make sure to double check the feature list accessible for the plan you want to purchase before you settle with the final decision. You don’t want to end up paying for a plan that comes with features you are likely never going to use. All features can be placed in 5 big categories – spelling, grammar, punctuation, writing style, and plagiarism checker. But these are the core features that every grammar checker will have to offer, more or less. There are also additional, more attractive features that this software can come with. This includes a personal dictionary, online editor, writing statistics, grammar rules, vocabulary, and so on. Only pursue the features that you think you can benefit from in terms of streamlining your workflow. Are you a tech-savvy writer? Then you might be interested in grammar checkers with advanced interface options and app settings. On the other hand, if you don’t have the time to go through all those neat tune-ups and want an app that seamlessly integrates into your workflow, there are lots of options for you as well. Remember, ease of use also applies to the installation process. We suggest that you try out the tool you are interested in to get the feel about its complexity. Hit the YouTube videos and asses the app’s ease of use. Tutorial and showcase videos can be really useful for this. Since it is still a piece of software that we are talking about, you may experience trouble using it, or it may start behaving oddly and even stop working completely. This is why you should make sure that the company in question offers customer support. Integration is a powerful grammar checker tool feature, especially if you enjoy working in a cloud environment, such as Google Docs. As we have mentioned earlier, some grammar checkers have dedicated desktop and mobile apps. This enables them to check your grammar and spelling in apps whenever you use your keyboard to type. If your favorite tool is one of the popular office packages such as Microsoft Office, LibreOffice, WPS Office, Apache OpenOffice, or any other for that matter, you have to check if the checker supports integration with your favorite tool. There are also browser integrations. Grammar checkers offer plugins for popular browsers including Google Chrome, Safari, Mozilla Firefox, and Opera. It’s worth checking this out if you spend a lot of your time corresponding with your clients online, responding to comments on your blog, and so on. Grammarly is one of the most popular grammar checkers out there, used by millions of people. It offers free online text editor and free browser extensions for Chrome, Safari, and Firefox that corrects over 150 types of errors. When you sign into Grammarly, you will see two options – you can import your text or start writing inside the tool. When you enter or copy-paste the text, mistakes will get flagged automatically. Grammarly has the power to detect errors such as punctuation, grammar, writing style, contextual spelling, and sentence structure. For all the mistakes, Grammarly will give you an explanation of what you did wrong and offer to improve or replace errors. It supports different writing styles including blog posts, business texts, academic writing. It also supports both British and American English. If you use subject-specific words that are not recognized by Grammarly, you can add them to the dictionary so that they don’t get flagged in the future. You can use primary Grammarly tool for free. If you want to supercharge your writing processes, you can go for an upgrade for around $30 per month. Grammarly Premium checks for over 250 types of grammatical errors, detects plagiarism and provides citation suggestions. Apart from checking your text for errors, WhiteSmoke will also generate a report that will review and rate your writing. Rating is judged in six different categories: sentence structure, words, expressions, voice, length, and redundancy. Not only can you correct your texts, but it will also give you suggestions on where your writing needs improvement. It is one of the best software solutions for grammar checking, syntax, and spelling. It also does all these things in real time. You won’t have to cut and paste lines of text from one program to another to check whether it’s good or not. Although this is not an online tool per se, it can also edit your content when you are writing something online. It is an impressive tool that can handle all your needs and checks your writing, no matter where you are. 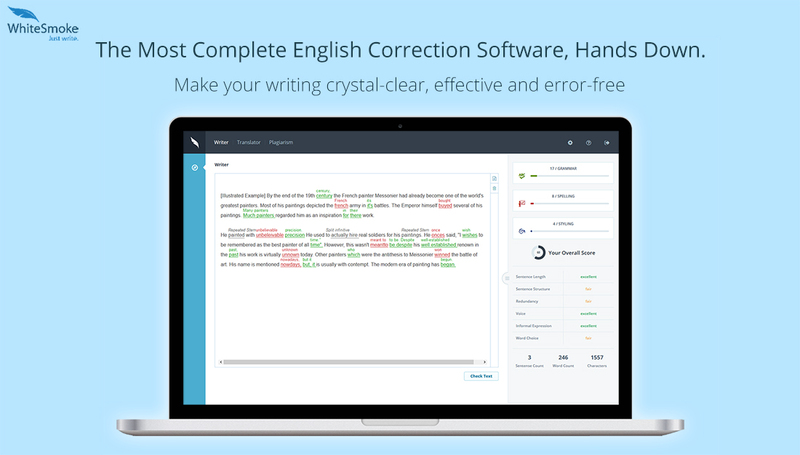 This tool is a grammar checker, style editor, and writing mentor in one. Not only does it help you write grammatically correct, completely clean and error-free sentences, but it also suggests thousands of style improvements help you enhance readability. With ProWritingAid, your writing will never be clumsy or awkward, even when it’s grammatically perfect. The tool will analyze your writing to eliminate any inconsistencies, vague wording, repetitiveness, passive voice, sentences that are too complex, and much more. ProWritingAid does all this by generating 25 writing reports: writing style, grammar, overused words, clichés and redundancies, sticky sentences, repeats, sentence length, pronouns, transitions, consistency, pacing, dialogue tags, readability, vague and abstract words, thesaurus, diction, alliteration, homonyms, corporate wording, acronyms, complex words, eloquence, combo, house style, and plagiarism. There are three versions of ProWritingAid available. The free version (which is online only) allows 19 writing reports and editing 500 words at a time, while the two premium versions come with all the 25 reports and have no word limit. Another online grammar and punctuation checker which resembles Word. Ginger has a lot of useful features and options. It is a helpful tool that can make people’s lives easier, especially if English is their second language. Ginger has a unique pricing system, with three available versions: free, basic and premium version. The first one is, of course, free, while the basic costs $5 per month or you can get it for life with a single payment of $40. You can get the premium version for around $90 for life. One of the best things Ginger has to offer and why a lot of people use it is the fact that it can integrate with MS Word. You won’t have to upload documents into the tool and, or copy and paste it to your MS Word. Instead, Ginger will proofread your documents inside your Word documents. Ginger supports British and American English and is designed to make up for where Word fails, so these two work quite well together. The first thing that makes LanguageTool stand out from the competition is that it can correct grammar in many languages. Another particular thing about LanguageTool is that you will have to download their software so that you can use it to the fullest. But they give new users a free online trial of their grammar checker. That way you can try it out and see what it offers and how it works before you decide to download the software and use it on your computer. LanguageTool does not provide a lot of features, but what’s available work flawlessly. A lot of users say that this tool has the potential to fix grammar mistakes that no other device can detect. This tool is available to everyone, the only thing you have to do is install the software on your computer. The site offers three different types of download to choose from so that you get a suitable solution. 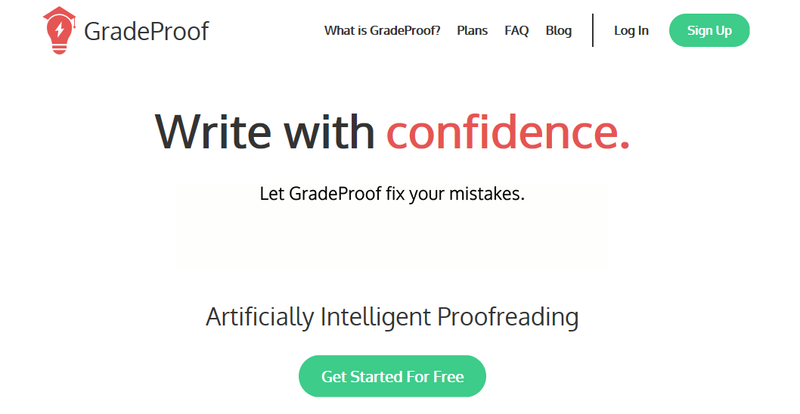 GradeProof is an advanced proofreading tool powered by artificial intelligence. Because of AI, the tool gets smarter with your writing. The more you write, the better it is in providing you with intelligent suggestions to enhance your writing. This intuitive tool corrects grammar mistakes, spelling errors, and provides suggestions for rephrasing your sentences. GradeProof also conducts plagiarism checks by scanning for similarities with previously published content. This is perfect for maintaining your integrity, as you can make sure that your writing is original. The tool also comes with writing statistics, which let you keep track of your word count, grade level, and readability. It also allows you to customize it to your needs and preferences. For instance, you can create your personal dictionary, and configure writing and reading speeds. There are free and premium versions of GradeProof you can choose from. The free version comes with basic features only: spelling engine, grammar engine, and custom dictionary. The premium version includes the basics but also includes an advanced grammar engine, eloquence engine, and plagiarism engine. As the name states, this tool is an online grammar and punctuation checker. It allows finding grammatical, spelling and stylistic errors in your text. If you open the web page of that tool, you will get a minimalistic text editor where you can enter the text you want to proofread. Online Correction has an autocorrect feature. All the corrected mistakes can be seen on a separate page. Online Correction offers several English dialects, including British, American, and Australian English. It has a minimalistic design, making it one of the best solutions for those who don’t want a lot of advanced options. It is created for people who want to do some substantial checks on their text. Try it out; you only need a minute or so to do it. Paper Rater is one of the most popular online spell checkers that can also perform plagiarism checks. Apart from the fact that it works well, Paper Rater is also completely free online based tool. Meaning that you won’t have to bother yourself with downloads or installations. A lot of freelance writers, bloggers, and students rely on this proofreading and grammar tool on a daily basis, and a lot of them recommend it. Paper Rater has over 10 billion documents stored on servers, and it can compare them with the inserted text for plagiarism. Not only does it have the ability to check for copied writings, but it will also find similar work on topics that other writers have published. It might save you the embarrassment of someone claiming that you copied their work. SpellCheckPlus is a very decent online grammar checker tool. It is also an online tool designed for non-native English speakers. When you compare SpellCheckPlus to other instruments, it seems to be using a different kind of system to analyze the texts. SpellCheckPlus offer a free version, but with limited features. It won’t offer suggestions, perform deeper analysis or explains why something is incorrect. It means that it cannot give you the feedback you need to correct your writing mistakes and improve in the future. The methods it uses are like in all the other tools. You input the text you want to go through and then run it. If you want to get all the perks of SpellCheckPlus, you will have to switch to the pro version. It costs $15 for an individual license. This app can correct mistakes, and analyzes your writing skills, and gives you a readability score. If you didn’t know, the readability score is the level of clarity of the text. The higher the readability rating, the easier it will be to read and understand. There are two versions of Hemingway – a free online version and a desktop tool that costs $10. Apart from giving you suggestions on how to improve your style and perfect your phrases, this app also counts the number of adverbs within the text. Additionally, it counts passive voice constructions and provides a suggestion on how many you should use, based on how long your writing is. But, Hemingway doesn’t check grammar, nor does it proofread texts. This tool is most suitable for copyediting. Writing grammatically correct, error-free sentences is very important, whether you’re writing an email, a message to a client, a blog post, or a novel. This is why you need to have a proper grammar and spelling checker app on the device that rarely ever leaves your side – your smartphone. Here are the best mobile grammar and spelling checker apps, all of which are completely free and can be found on Google Play and the App Store. This app is like a portable grammar dictionary that you can carry in your pocket. It corrects all your grammar and spelling mistakes as you type, helping you write comprehensive, clean, completely error-free sentences. It includes 20,000 words, but you can add more to the dictionary from every sentence you write. The app also comes with a Text-to-Speech option, which is perfect if English is your second language and you want to learn proper pronunciation. The app can read aloud everything you type. The Spell Checker app is another awesome app for Android that can help you write sentences without any spelling mistakes. It’s great for proofreading your texts, be those messages, emails, notes, or any other type of content. It doesn’t include any grammar checks, but its spelling checks are more than useful. As soon as it detects a spelling mistake, it flags it and provides you with suggestions from its dictionary to correct the mistake. What makes this app stand out is the option to send your messages directly from the app. You can send messages to Facebook, Twitter, Skype, and many other platforms, including email. This saves you lots of time, and the app even stores and organizes all your typed documents. The app also comes with the option for voice typing, saving you more time and making your writing much more convenient. CorrectMe is a very fast and user-friendly app for improving your writing. Not only does it correct all your grammar and spelling mistakes as you type, but it also uses a built-in synonym checker to provide you with suggestions for different words you can use to supercharge your writing skills. While this app is completely free on all iOS devices, it does come with a pro version that you can purchase. It’s pro version comes with a few advanced features, such as smart recommendations and grammatical explanations. Speller is another very cool app for iOS devices. It’s an open source spell checker that combines multiple sources to help you find dictionary definitions, which is ideal if English or Spanish is your second language since the app supports the two. It comes with Spanish, and American, British, and Canadian dictionaries. Being a spelling checker app, it checks your spelling as you type, helping you write error-free texts. Apart from giving you spelling suggestions for misspelled words, it also provides you with alternate suggestions for correctly spelled words. This is great for enhancing your writing style, especially when writing business emails or professional texts. To choose the right tool to use, you need to know your needs and understand the features those tools have. For example, if the tool is too simple, it won’t detect errors when you write technical content or something complex. Take your time and go through each tool, try them out and see which one suits you the best. Remember to work on your writing skills and keep improving. Although these tools can be quite helpful, they can’t make you a better writer unless you put in a lot of effort. « Previous The Complete Email Marketing Guide: Everything You Should Know! Writing in English is difficult for everybody who is not strong in the English language. Sometimes you might think that you have written a perfect post but did you know that small mistakes can give away to the charm of your writings. So, it is wiser to use Noun Plus grammar checker tool. I use Grammarly and I particularly love the features. It works both on my phone and pc and it has significantly improved my writing skills. I totally recommend them to everyone who really wants to get serious with professional writing. Wow. This list has everything and I’m not even sure which to pick anymore. They all have amazing features and I’m sure they will work just as I want. Maybe I’ll try the Grammarly since I heard a lot of good reviews about it. Grammarly is the best. I have it as an extension in Chrome and also in my MS Word application. It has made writing a lot easier and the fact that I get reasons and explanations on each error is enough to improve my vocabulary and writing. I’ve used like 4 of the tools on this list and they all delivering the expected results. If you write professionally, or even for yourself, you may want to have one of these to make the whole thing a lot easier and faster for you. I have no problem with grammar, being a college English teacher. But I am an abominable speller. So I need a spellchecker that is 50 times better than the ridiculous one that comes with WORD, which is beyond belief stupid and idiotic! I also don’t know how to download a superb spellchecker that will automatically open in Word every single time without me having to do anything special. I’ve tried following online directions, but I just don’t understand them, and they don’t function for me. Suggestions for a smart editor that is dim about spelling and computers?? For years I have been stalling trying to write a book but didn’t have a clue of how to put together the manuscript because I had major problems with grammar, spelling, and simply putting a manuscript to begin with! 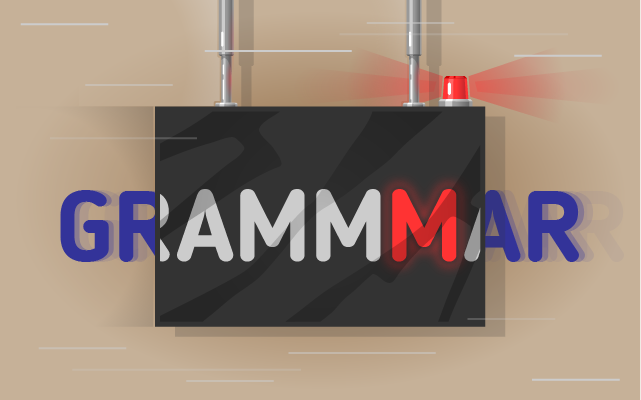 Thank you Anja for this great list of grammar checker tools! I’m using Ginger Online and for a single payment of $40, you can get it for life. We’re glad that you like the list. Ginger Online is a great tool. For all the mistakes, Grammarly will give you an explanation of what you did wrong and offer to improve or replace errors. Great tool for a small price! Thanks Steve. That’s why we placed it at #1 spot.